Last weekend I made a spiral ham on the smoker, and it was delicious! Unfortunately, there were only two of us home to eat it, (my husband and myself) which made for a lot of ham leftovers. 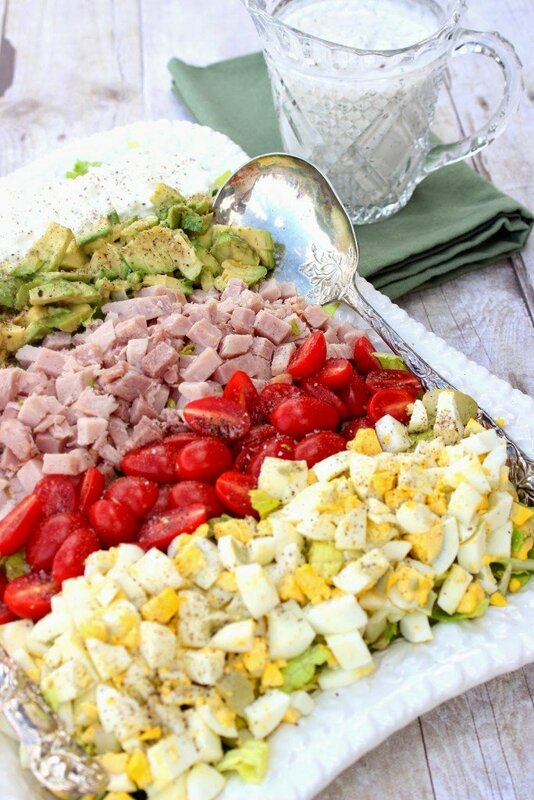 Naturally I had to think of a few ways to use up all the leftover ham in the fridge so I decided to make this Kudos Cobb Salad which was inspired by a recipe I saw on Damn Delicious. One thing you’ll notice if you go to Damn Delicious to check out her cobb salad is that her photos are pure perfection! Mine…not so much. But, you do what you can in the late afternoon, as the sun is setting, and your company is just moments from ringing the doorbell! -Place an even layer of the romaine lettuce on a large platter. 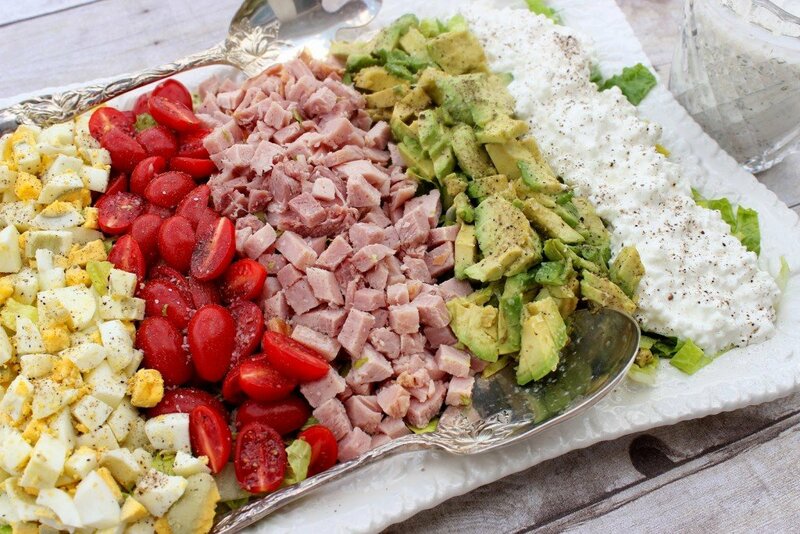 -Arrange the ham, tomatoes, avocados, eggs and cottage cheese in neat rows on top of the lettuce. 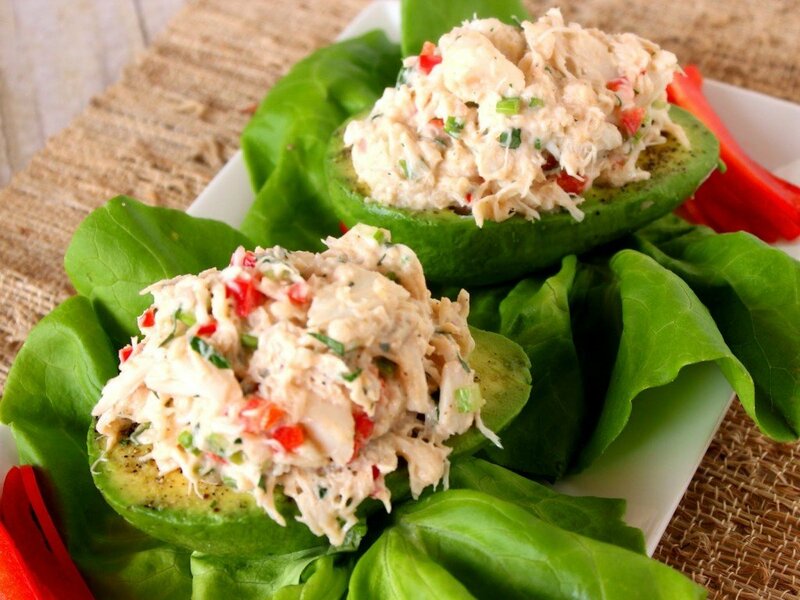 -Squeeze the juice from half a lime over the avocados to prevent them from browning. 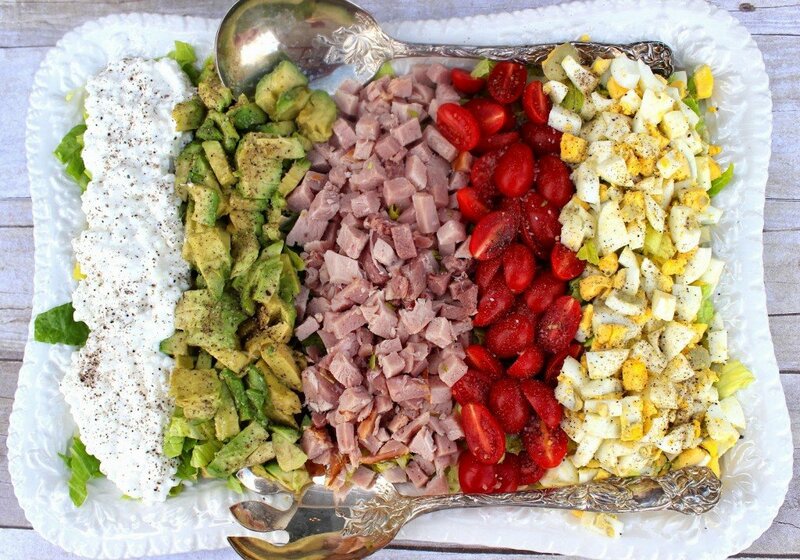 -Season the avocados, tomatoes, eggs and cottage cheese with salt and pepper to taste. -In a medium size bowl, whisk together the yogurt, mayonnaise, milk, 1 tablespoon lime juice, dill, garlic powder, salt and pepper. 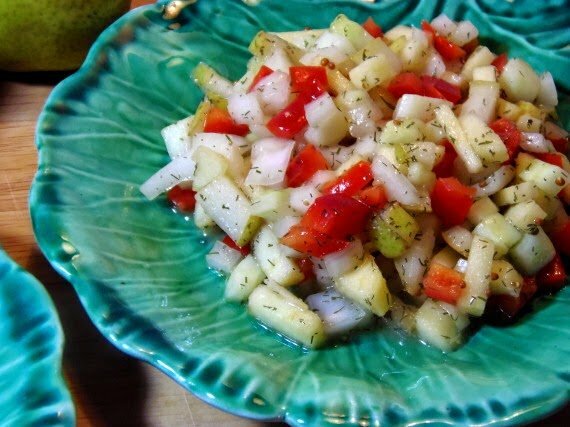 -Serve the salad immediately with the yogurt dill dressing. 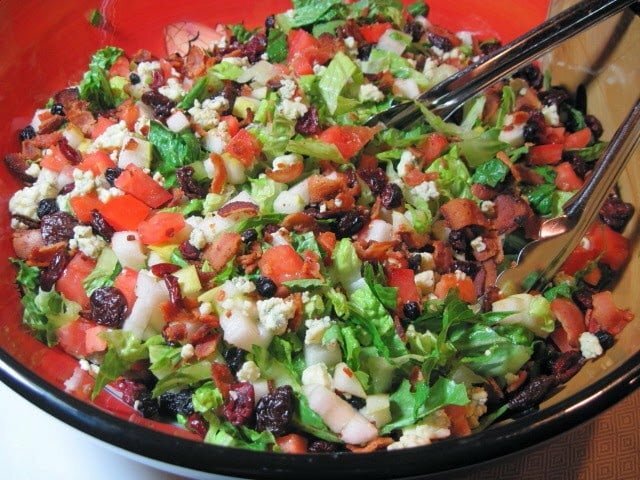 Oh, I have another tip for you…if you want to make this more of a Cinco de Mayo salad (after all, today is the 5th of May), replace some of the ingredients with black beans and maybe add some crumbled Cotija cheese into the rows and then give it all a sprinkling of ground cumin. YUM! See how versatile and fun this one salad can be? 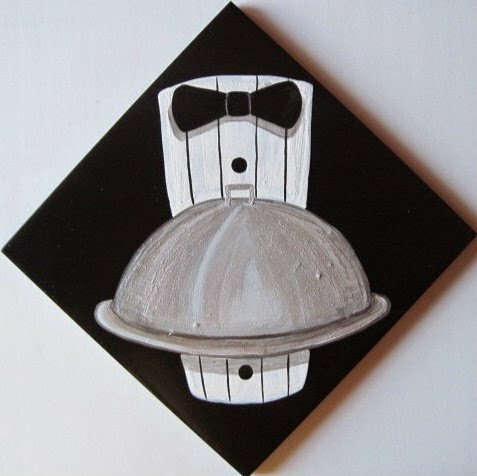 This is a ceramic tile painted trivet. If there is ever anything I can paint for you, please don’t hesitate to contact me or visit my shop which is located within the navigation bar. Custom orders are always welcome and I can work from any photo or description you send my way. Beautiful salad Renee, love the dressing, sounds delicious! 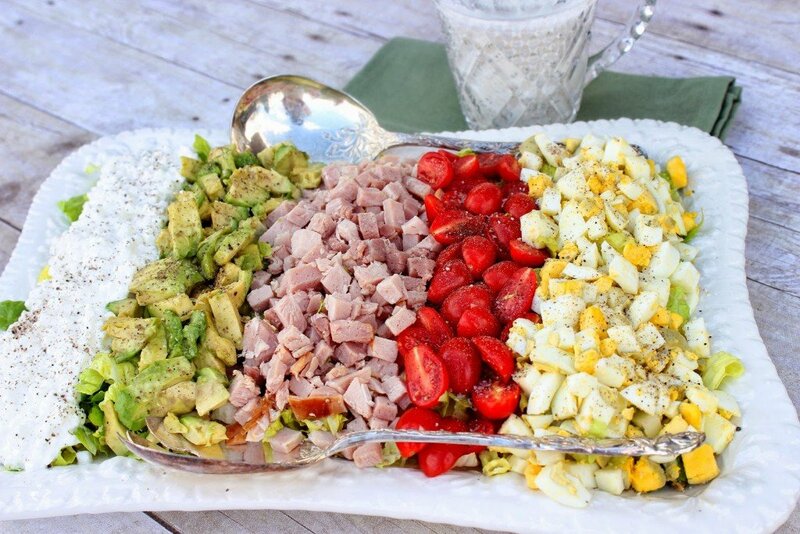 Cobb salad is such a great meal idea. Your added serving suggestions sound lovely and what you served up looks wonderful (the avocado is a great idea).